If you and I were sitting around having coffee and chatting right now, I would telling you all about my trip to Italy this past May. I would also be calling the barista over and asking for an espresso instead of café Americano. I would be telling you how traveling with 15+ people is insane - but when it's 15 people who have a heck of a good time together, it's mostly just a giant party. In Italy. My husband and I went to Italy with my four cousins, plus one of their husbands, and the others fiancée; along with my Aunt and her husband; her husbands daughter, son, son's roommate; and nephew; and a family friend and her boyfriend. My Aunt's husband was born in Junadi, Italy, which is in the Calabria region of Southern Italy. His family still lives there, and he has a home there, where we stayed for the first half of the trip. While with the family, we ate/drank our weight in homemade pasta, dried meats, chicken, olives, olive oil, bread, tiramisu, lemoncello, Peroni, and wine. 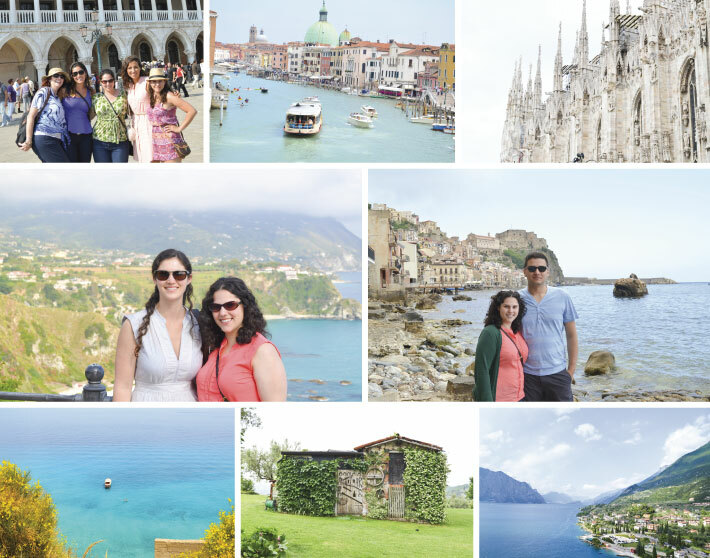 During our first half of the trip, from Calabria, we visited the Aeolian Islands off of Sicily, Tropea, Scilla, and a few other coastal cities. It was absolutely gorgeous and unlike anything I've ever seen before. Although I do have to admit that I am definitely not a heights person. Why are all of the roads in Italy narrow, high up, and terrifying? After visiting southern Italy, we said goodbye to the family and flew up north. We stayed at the most unbelievable bed and breakfast in the mountains between Milan and Venice. I wish I had more pictures of the space - it was a several hundred year old house stable and barn that was in the owners family for hundreds of years. The owners, a teacher and a doctor, inherited the property and spent years restoring it with incredible antiques and collectible artwork (they had a Picasso above the fireplace). The ivy covered stable in the above photo (bottom row, center photo) was on the property. We visited Trovisto, Milan, Venice, and Lake Gordo during the second half of our trip. We continued to eat our weight in whatever we were served. I absolutely loved Lake Gardo (bottom row, right corner) and found an antique door knocker in one of the little villages - we can't wait to put it on our new front door. Our trip to Italy happened to fall one week after we closed on our new home, and about three weeks before I left my full-time job. I'd be lying if I said it wasn't a little stressful to close on a house and turn around and leave for two weeks. We took advantage of the situation by having the new house painted while we were gone, and we celebrated Sincerely, Jackie with LOTS of wine while in Italy. It was surreal to be in such an incredible place, during a time of huge transitions in our lives. We truly felt like we returned from Italy ready to start fresh on an entirely new chapter in our lives. Have you ever marked a transition in your life by going on vacation, or any other way? I would love to hear about it!